Unexpected Gifts by S.R. Mallery lives up to its name. And the wrapping on that gift peels off layer after layer until the final beautiful gift reveals itself. The book takes the reader on a journey through one young woman’s legacy left by her ancestors. Sonia feels adrift in her life as she continues her relationship with an up and coming rock star and pursues her degree in psychology. Starting with her parents’ lives in the 1960s, she goes back through the years of the twentieth century as she “unwraps” the gifts left her. It’s not always a glittering and shiny gift, but there’s always a secret revealed as Sonia applies the lessons from her parents, grandparents, and great grandparents to her own life. The book revisits some of the most significant events of the 1900s going back to its earliest years. Immigrants and Ellis Island; Detroit and the assembly line; the Great Depression and the climb out of it; women’s suffrage; the rumblings of race relations prior to the Civil Rights Movement; Woodstock and Vietnam—it’s all in this gem of a book. Ms. Mallery shows the connection to our family ties and the lessons that should be learned from the painful experiences of those who went before. I felt the scenes with Sonia’s great aunt Adriana were the strongest ones—or at least the ones that held an important meaning for me. Adriana is caught up unwittingly—or so it seems—in so many important causes in the first half of the century. Yet, Adriana’s sensibilities are all there in the movements, but not finely tuned until she experiences firsthand what it meant to be black in the United States. She relates through the prejudice she witnesses and through her own experiences as a woman as she fights for the passage of the Nineteenth Amendment. The most compelling part of Unexpected Gifts comes from the perspectives presented. We are shown the worst side of the characters through the eyes of another. Then a short while later the perspective switches as the author changes point of view. Then we begin to understand, if not wholly condone, the behaviors and thoughts behind some of the worst characters. Sam, Tony, and Andrei, the fathers in each of the decades portrayed, are human, fallible, and often times cruel. But when the telescope delves into their minds, the reader is shown that judging others without living their lives, does a great disservice to us all as humans. Ms. Mallery shows us that the ones to suffer the most are the ones inflicting the most harm on others. 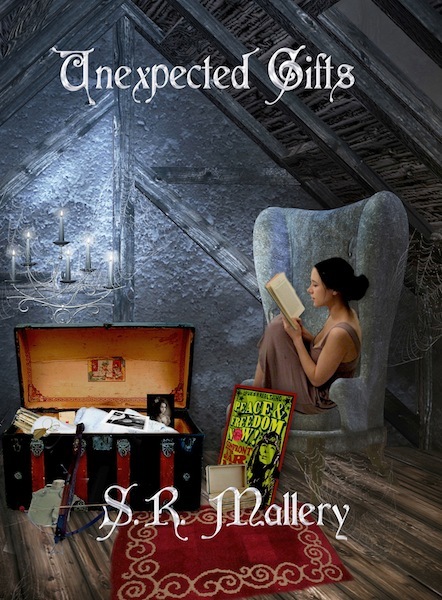 If you love history, particularly of the twentieth century in the United States, and if you love family sagas that connect the generations, then Unexpected Gifts is the perfect read, and the perfect gift to give someone unexpectedly. This entry was posted in Book Review Friday, Ramblings of a Writer and tagged depression, Detroit, history, twentieth century, Vietnam, women's suffrage, Woodstock. Bookmark the permalink. This sounds like a good read and I love the cover! It is a great read, Wendy. Thanks for dropping by the blog. Reading this book was truly an “unexpected gift” for me. Ooooooooooo, this one sounds good. You will love it, Marilyn.